(Waldorf, Md., Jan. 25, 2018) – The Southern Maryland Blue Crabs announced Thursday that infielder Michael Snyder has reached an agreement to join the Atlanta Braves organization. Snyder will report to Spring Training with the Double-A affiliate Mississippi Braves. The powerful 1B/DH first joined the Blue Crabs at the start of the 2016 season. Snyder quickly became a fan favorite, bursting onto the scene by hitting .304 with a team-high 25 homeruns. His homerun total in his debut season was the second-highest single season total in franchise history. Snyder was named the starting first baseman for the Freedom Division in the 2016 Atlantic League All-Star Game. The Virginia native announced he was resigning with the Blue Crabs for a second season on February 9th, 2017. He picked up right where he left off the season before, leading the team with 25 homeruns and 72 RBI’s, earning another starting spot in the 2017 All-Star Game. 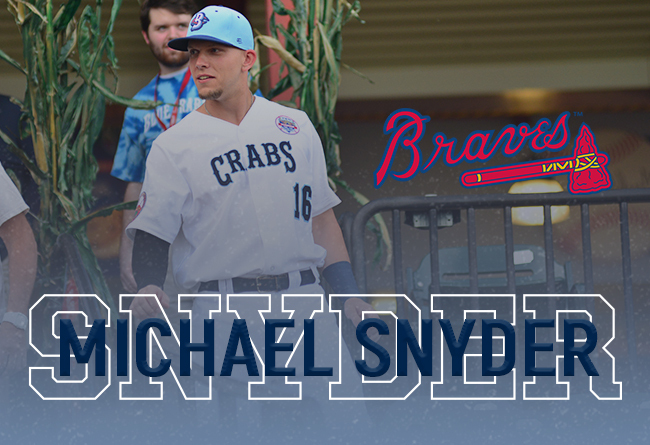 Snyder played a key role in the Blue Crabs playoff run last season, finishing top 10 in the Atlantic League in homeruns, RBI’s, runs scored, doubles, walks, and slugging percentage. Prior to joining the Blue Crabs, Snyder spent four seasons in the Los Angeles Angels organization. He was originally drafted in the 23rd round of the 2012 MLB Draft out of Florida Southern College. In his four seasons with the Angels, he appeared in 355 games, reaching as high as AA in 2015. Snyder is the third player from Southern Maryland signed since the start of the 2017 season. He will join former teammates Danny Muno and Justin De Fratus, both of whom signed with the Seattle Mariners in 2017. The Blue Crabs open their 2018 season on April 27th at home against the Long Island Ducks. To save your seat at the ballpark for the upcoming season and for other team news, visit www.somdbluecrabs.com or call 301-638-9788. The Blue Crabs play 126 regular season games in the Atlantic League of Professional Baseball Clubs. The Blue Crabs play at Regency Furniture Stadium in Waldorf, Maryland with affordable family fun. The franchise will begin its 11th season in April 2018. Please call 301-638-9788 or visit http://www.somdbluecrabs.com for more information.